EMILY COLLINS joined the list of the winners of the Phil Kosin Illinois Women’s Open, the tournament in it’s 20th year. Collins shot a final round 1 under par 71 to win the championship going away by 9 shots. In the early going Collins gave a few shots back to the field with a double bogey on 5, and another bogey on six. Then she caught fire with birdies on 7-8 and 9 and opened her lead back from two to seven in that period. During the back nine at one point she lead by as many as ten shots, she won by nine. Collins a recent graduate of the University of Oklahoma and the lady Sooners golf program, that took 4th place in the NCAA nationals will now try to get ready for the Q-school on the LPGA tour. Collins admitted she played the last few holes a little conservative because of the size of the lead that she had. If she is not competing at golf on a higher level in 2015, she looks forward to returning to defend her first professional title. She admits she loves Mistwood, and not just because she won. The IWO was Collins second professional tournament, she took second in the Texas Women’s Open which was her first tournament. Emily Collins with the Kosin Cup after winning the 20th Phil Kosin Illinois Women’s Open. The real battle on the golf course during the final round was for second place, and four golfers tied for second at 221 a five over par score. Allyssa Ferrell shot a 3 over par 75 and finished at 221. Joining Ferrell at +5 nine shots back of Collins were (a) Ashley Armstrong from Flossmoor who closed with a 72,(a) Ember Schuldt from Sterling and (a) Lisbeth Brooks from Waunakee Wisconsin who shot a one under par 71. LPGA player and two-time IWO champion Nicole Jeray shot an even par 72, but was 13 shots back of Collins. The best round of the day went to (a) Bing Singhsumalee of Naperville who shot 70. With her victory Collins won the $5,000 dollar first place check out of a purse of $25,000. Some of the news from the tournament is that on August 18th, the old Mistwood clubhouse will finally be torn down. Work will start on a new facility a soon as demolition is complete, the new building or building there will be two of them, will be connected by an underground tunnel. The Gog Blog will have a feature on the third phase of the renovation of Mistwood in the short future. The new clubhouse should be ready for the start of the 2015 Illinois Women’s Open. Greg Kosin, Phil’s brother came to present the winners trophy to Collins in a ceremony held in the Mistwood performance Center. Mistwood will be open this fall while the new clubhouse is under construction. So come play Mistwood. (815)-254-3333 and remember “Keep it in the Short Stuff.” Thanks Phil. Click here to hear the press conference with 2014 IWO winner Emily Collins. The Western Amateur at Beverly Country Club is underway. Round one is in the books, and Geoff Drakeford from Australia made Beverly look easy with a 7 under par 65. At the end of the day he was not alone in first place as Zecheng Dou of China matched the score of 65. Beau Hossler sits in fourth place after shooting 67, but what was more interesting was the way he did it. Hossler shot 37-30 and played the last 6 holes in 8 under par. Some local scores of note. Charlie Danielson from the University of Illinois Golf team shot 68 and is T-8. Arlington Hts. Doug Ghim shot 69 and is T-11 with defending champion Jordan Niebrugge. Illinois amateur champion Raymond Knoll of Naperville shot 70 and is T-20, and is tied with another U of Iowa golfer Brian Bullington of Frankfort. 2012 WGA Junior Champion Conor Black of Texas who won at Beverly, didn’t have the success in round one. Coming in at 78 and was T-142. Round two will be played on Wednesday. LPGA communications officer Kraig Kann checks in with a behind the scenes look at the inaugural International Crown. The guys discuss recent tournaments, including the Illinois Open and the British Open. Mistwood GC owner Jim McWethy calls in to discuss recent renovations and the 2014 Illinois Women’s Open. Rory Spears reports live from Caves Valley in Maryland, the site of Team USA’s early exit from the International Crown. The golf courses of Lawsonia, in Green Lake Wisconsin. 3 hoursfrom down in the city of Chicago. 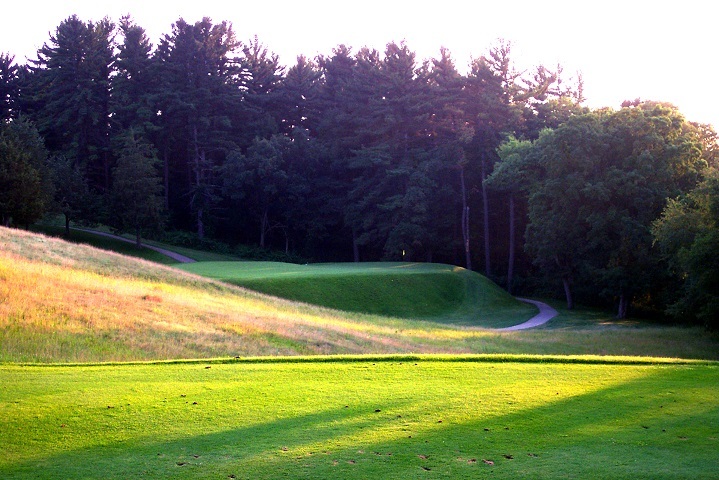 Now under the operation of Oliphant Golf, Lawsonia continues to become a major player in Wisconsin golf. The famed Links Course built in 1930 by famed Chicago architect William Langford is a true classic. It has the feel of some of the classic private clubs in the Chicago and Milwaukee area. The website has just been redone, visit Lawsonia.com and learn more about the stay and play packages, and all 36 holes at Lawsonia. Langford’s Pub has now reopened. (Owings Mill MD.) The USA got crowned in the inaugural International Crown. Eight countries made it into the event, five survived to make it to Sunday’s play. Team USA lost in a playoff to Korea, and joined Australia and Chinese Taipei outside the ropes for Sunday’s singles matches. Saturday was great golf drama for fans on the course or watching on TV, the format created exactly what it was supposed to do except for one thing. The USA was supposed to be playing on Sunday, they were the No.1 seed in the event coming in. If the USA had won the playoff the No.2 seed Korea would have gone home. The Crown is playing like the NCAA basketball championship, and some brackets have been busted already. The good news if your Korean, is that Sunday at the Crown does not have a Final Four, it has a Final Five and so you are still alive. World No.1 Stacy Lewis made a great point in the Saturday post round press conference when she said, “we are only two points out of first place and we are not playing on Sunday.” Lewis then had a confused look on her face. Both Lewis and Christie Kerr suggested tweaking the format, and from all evidence I have so far and that includes putting LPGA Chief Communications Officer Kraig Kann on our radio show Sunday morning where he addressed the format. It sounds like tweaks will be made. But should they made to improve the event, or are they getting made because the USA lost. Maybe both, but first time events always look for ways to improve the second time around. 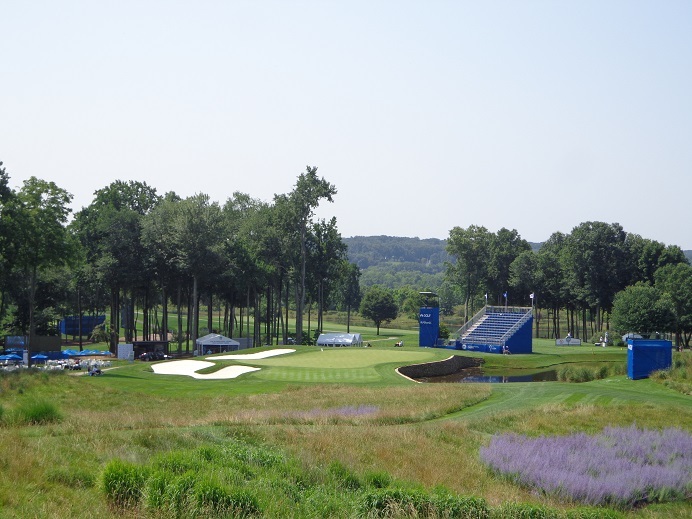 By the time the Crown tee’s off at Rich Harvest Farms, the LPGA should have a better event, and Jerry Rich should have a packed house roving around Sugar Grove and RHF. Jerry Rich (L) with LPGA Commissioner Michael Whan at Caves Valley. 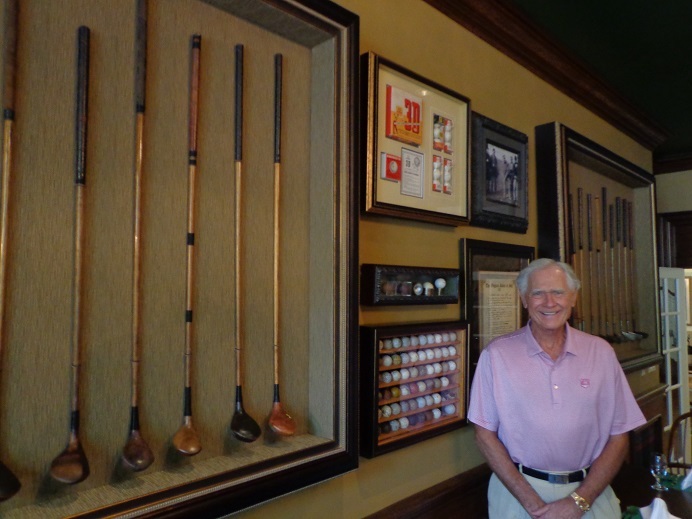 Rich and LPGA Commissioner Michael Whan sat in Rich’s kitchen some four years ago, and began planning the event. These two partners as they have become on this event, have made a lot of progress since the meeting in the kitchen. The next step is putting a title sponsor on the event. Word is that, there is a deal in place with a new sponsor, that announcement should come shortly. Once that happens, look for the push by Rich and his staff to make sure everyone in Chicago, or visiting Chicago knows about the International Crown. Rich organized watch parties the last few days in the Chicago area, American’s Korean’s, Japanese and other nationalities turned out in force to watch. Come 2016 they should be watching in person at RHF. 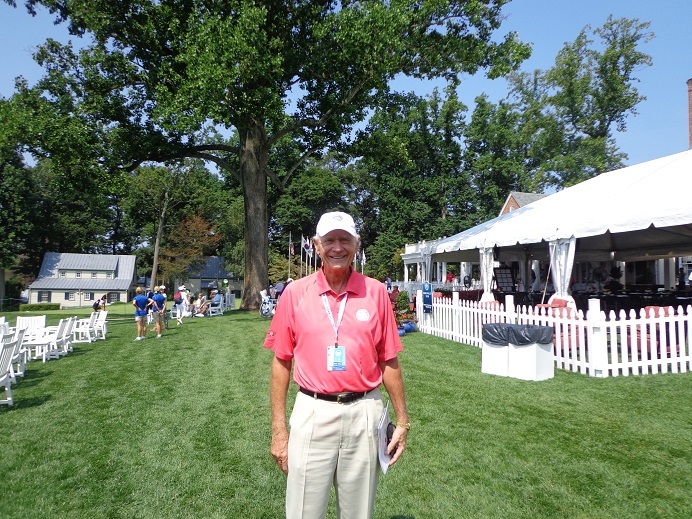 While Caves Valley Country Club, it’s staff and membership did a great job on hosting the first Crown, they probably didn’t have all the time or resources they could have used in getting a new world championship off the first tee. Those issues should not be in place for 2016. I fully expect Rich to put on a first class show, that will elevate women’s golf up another level or two. Whan accomplished what he needed to do this year. He got this event going before Olympic golf returned, he got the players to buy into it. He filled a void in the LPGA schedule, he helped grow the women’s game. That’s not just a home run, it’s grand slam in the game of golf. There will be a tee off event for the 2016 Crown in Naperville later this week, Whan will be there, so will some players and that trophy that Tiffany’s did such a great job with. 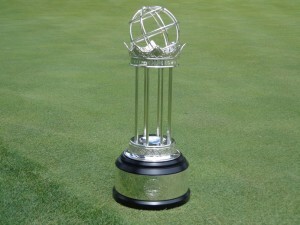 The International Crown trophy sitting on the 18th green during round 1 at Caves Valley. With that Rich and his team will be off and running. I’m sure the trophy will make some visits around town over the next two years. Maybe not as many as the Stanley Cup, but it will be visible. Rich will make sure of that. Rich and Whan have a great supporter in world No.1 Stacy Lewis. On Friday 90 minutes before teeing off in her match, she was texting Kahn telling him she had some great ideas to share for the 2016 Crown. In fact Lewis returned on Sunday after being eliminated to do media work, and watch some of how the championship played out. Not something you would get out of the men’s No.1 player, that’s for sure. Lewis got pounded on Facebook on a page by Golf Channel, some thought her comments were sour grapes. Lewis came to the media center and answered many of her critics via Twitter. Agree with her point of view or not, only a class act does that. All 32 players will give their input to the LPGA and it will be reviewed long before 2016 at RHF. As for my week at the Crown. It was a long one, but one that left me anxious that more high level golf will be headed Chicago’s way. If the Crown does happen at RHF in the years the PGA Tour skips out of the windy city, the Crown will do a nice job of filling the void. Defending WGA Western Amateur Champion Jordan Niebrugge at Beverly Country Club. Jordan Niebrugge will attempt to defend his Western Amateur title this week at Beverly Country Club in Chicago. Niebrugge will face a strong challenge from a stellar field of top amateur players. The championship is a mix of stroke and match play, and forces the winner to play steady game of golf in both formats. Spectators are welcome and admission and parking are FREE. This is one of the top amateur tournaments in the world, and a great tune up for players headed to the USGA Amateur championship. Tee’s off today and concludes on Wednesday. Several past champions are in the field, along with several top contenders who have just missed winning the championship. Come see Mistwood, and tour one of Chicago’s top public courses, and see the incredible new Performance Center. Spectators welcome, parking and admission are free. Today at Onwensia CC is the Illinois PGA Senior Masters Pro-am, IPGA professionals Kevin Marion of Old Elm and John Schickling of Rolling Green CC are the honorees. Congrat’s to both and thank you for your contributions to the game of golf. Great week of Golf ahead around town, go watch and Go Play. Keep it short stuff too, Thanks Phil. THE RICH REPORT…looking at the final day of the International Crown from Caves Calley CC in Owings Mill Maryland. 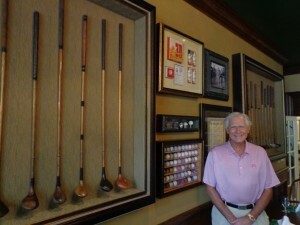 Rich Harvest Farms Owner Jerry Rich with some of his golf collectibles. The Rich Report is only right here on the Gog Blog. 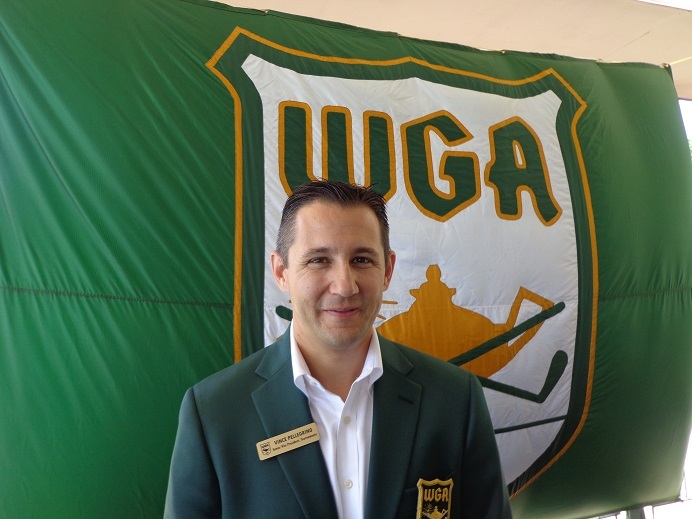 After play for the International Crown concluded on Sunday, the Gog Blog spoke with Rich regarding his thoughts for the week. The Rich report will return here and there as news about the 2016 International Crown happens, and Mr. Rich is available for comment. In light of comments by american players about a format change, that were not received well by those on social media who felt Team USA needs to accept defeat. Stacy Lewis became the top target, Lewis hung around to see the end of the championship and do some work on TV. She later came to the press tent and answered some of her detractors on Twitter, when asked about doing that Rich said. The turnout at the watch parties in Chicago were very good, especially by the Korean people. He is ready for the 2016 Crown tee off event in Naperville later this week. LINKS & TEE’S LAKE AVE. IN ADDISON. $20, PRACTICE OR PLAY ALL DAY SPECIAL, Footgolf coming soon. Addisonparks.org. Spain that went into the final round as the two seed won all four of it’s matches on Sunday, and earned the full 8 points possible to win the first International Crown. Team Spain came out flying as Carlota Ciganda was five up in the first six holes and 7 UP by 11. Her start inspired teammates Beatriz Recari and Belen Mozo who quickly jumped out in front in their matches. Mozo’s birdie on the par 5 16th hole, clinched the deciding point for Spain. Azahara Munoz had to come from behind and was the last match to be completed, after her win on 17 Spain had swept the day and was ready to get Crowned. Recari said she felt more in control of her game today, and that she felt focused and ready to go. It’s different when you don’t have a partner. Team Japan went into the final day as the top seed, but they won only one match and had to settle for fourth place. American Stacy Lewis hung around the championship on the final day doing several media interviews. Lewis spoke on Saturday about tweaking the Crown’s format going forward. She was taken to task on social media by fans who said she had “sour grapes.” Lewis came to the media center and went online and did address many of her critics with direct responses via Twitter. Something you don’t normally see a No.1 player in the world do. The 10 match recap is as follows. Scores Spain 15, Sweden 11, Korea and Japan 10, Thailand 9, USA 6, Chinese Taipei 4, Australia 3. Part of press conference with team Spain. 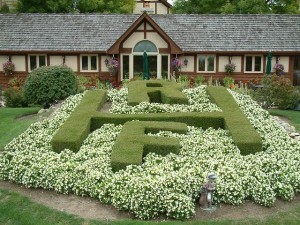 SEE THE NEW WEBSITE AT LAWSONIA.COM LAWSONIA GOLF IN GREEN LAKE WISCONSIN, HOME OF CHICAGO ARCHITECT WILLIAM LANGFORD’S FAMED LINKS COURSE. BY: RORY SPEARS LEAD WRITER AND ASSISTANT EDITOR. 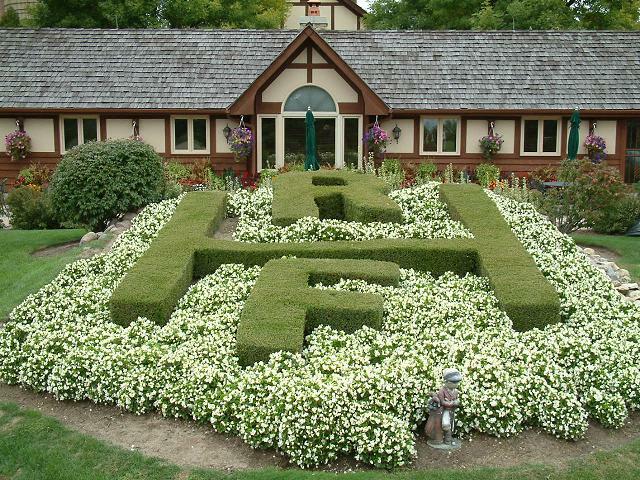 Jerry Rich’s Rich Harvest Farms will host the 2016 Championship of the LPGA International Crown. The dates are expected to be in July of 2016 and in advance of the Olympic Games of that year. Rich returned to the Chicago area on Friday night, so he could prepare to start attending various International Crown watch parties. On Saturday he attended a party in Hoffman Estates. After play completed for the day, he spoke with Big 3 partner Len Ziehm and the Gog Blog with his observations of day 3. Ziehm has a recap on his website, visit Lenziehmongolf.com. Rich made the rounds at the watch party and spoke with many of the people in attendance, including the Korean Newspaper that was present. The Crown is having an impact already in Korea, as many thought it would. He admits it’s hard to say what it will be like on Sunday at Caves valley with Team USA gone. When asked what the American team must think now, Rich added. Hopefully it will be motivation for the USA when Rich Harvest Farms rolls around in 2016. Visit Startechglass.com or see the showroom at 1835 N. Major Chicago. Call (773)-745-0800. Celebrating 25 years as a Chicago leader in Commercial Glass. THE EARLY EDITION THIS WEEK…from the LPGA International Crown. Coming in 2016 to Rich Harvest Farms in Sugar Grove IL. 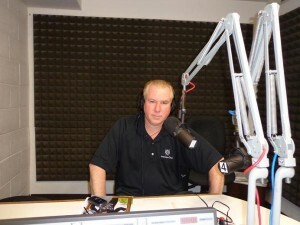 GOLFERS ON GOLF RADIO 9 AM ON SUNDAY’S. 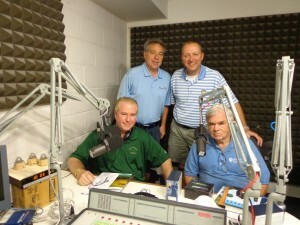 WSBC-AM 1240 AND WCFJ AM 1470. Chicago’s favorite foursome on right is standing Mike Munro and Ed Stevenson, seated Rory Spears and Bill Berger. This Sunday we have an outstanding show that looks at the heart of golf this weekend nationally and next week in the Chicago area. If you miss the show live, you do get a mulligan. That is if your on the golf course or the practice range. Look for a re-posting of the show right here on this website. 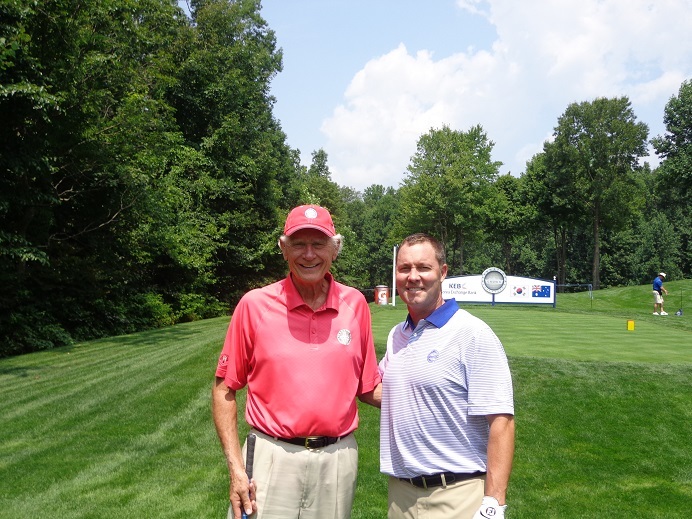 THE INTERNATIONAL CROWN-has been launched from the Caves Valley CC in Owings Mill. More International Crown News will be made later this week in Naperville, stay clicked in later in the week for details. Up first on the show is your’s truly live at the International Crown, we will recap the week and look ahead to 2016 at Jerry Rich’s Rich Harvest Farms in Sugar Grove. plus what effect the USA’s early exit might have on this years International Crown and going forward. WGA Vice President of Tournaments Vince Pellegrino joins the show at 9:20. The Western Amateur Championship tee’s off on Tuesday this week at Beverly Country Club in Chicago. Jordan Niebrugge returns to defend his title. Northbrook’s Nick Hardy who is Illinois bound this fall, joins the field after a second place finish in the WGA Junior Championship. A stellar field is prepared to to do battle in one of the top amateur tournaments in the world. Spectators are welcome all week at Beverly and the admission is FREE. Mistwood GC owner Jim McWethy joins the program at 9:40. Getting underway today at the Mistwood GC in Romeoville is the Phil Kosin Illinois Women’s Open. Defending Champion Elise Swartout is in the field. Sunday marks the start of championship week with a pro-am, tournament rounds are Monday, Tuesday and Wednesday. There is a cut after 36 holes on Tuesday, several other past champions will be entered in the field. McWethy will talk about the improvements he and his staff have made at Mistwood. 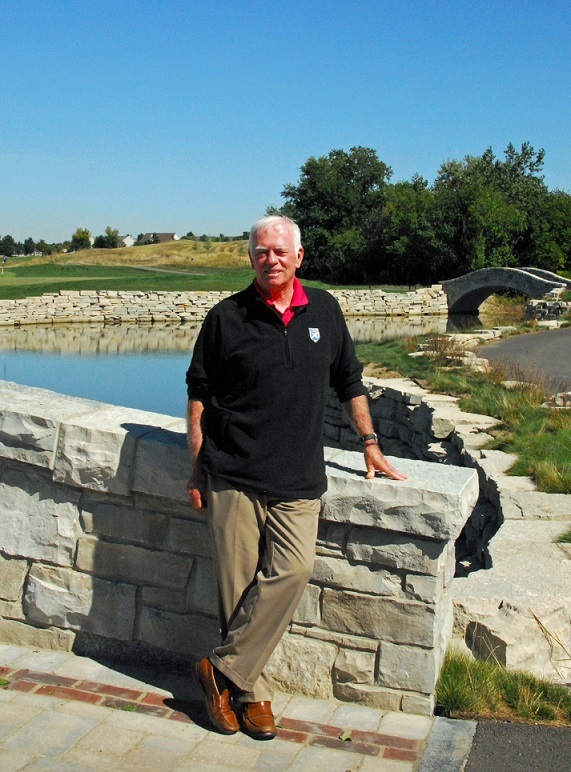 Those improvements have made Mistwood on of the top public courses in the Chicagoland area. BREAKING NEWS out of Champaign where the University of Illinois and Coach Mike Small have announced the departure of assistant coach Justin Fetcho, who has been named the new head coach at Southern Illinois University. It’s expected that Small will begin a search for a new assistant coach immediately. LINKS & TEE’S in Addison has announced that Foot Golf has been delayed until August, some of the items needed to get the program going are back-ordered due to demand. OLIPHANT GOLF that is now managing the classic designs at the Lawsonia Golf Club in Green Lake Wisconsin, is telling the Gog Blog that progress is moving forward at the new Sand Valley project in Central Wisconsin. Over 600 acres have been cleared and a layout for the first 18 holes is near completion by architects Ben Crenshaw and Bill Coore. BIG 3 partner has a recap of the International Crown watch parties and how it was viewed in Chicago. See Lenziehmongolf.com. THE GOG BLOG returns later today with our story from the International Crown. The Gog Blog Speaks Out is back on Monday. LINKS & TEE’S LAKE AVENUE IN ADDISON. (630)-233-7275 $20.00 PRACTICE OR PLAY ALL DAY-FOOT GOLF IS COMING. Reporting from Owings Mill MD. and Caves Valley Country Club. It was quite an effort over the last two days, but the United States did not survive the cut and missed advancing to the final round of the inaugural International Crown. Five countries moved on to Sunday play, three countries were eliminated from the championship. Along with the USA, Australia and Chinese Taipei went home a day early. It came down to a playoff to decide who was going to be the last country eliminated from Sunday play. Korea got birdies from both Inbee Park and So Yeon Ryu for a total of 8, and the USA got a birdie from Christie Kerr but only a par from Lexi Thompson for a total of 9. That advanced Korea to Sunday play as the wild card team. Sweden came out of the blocks early and made quick work of Australia, winning both matches. Sweden won by score of 7 & 5 and 5 & 3. Anna Nordqvist said “there wasn’t much said last night.” Perhaps the Swedes should keep that strategy with such convincing wins. Spain was the other big mover on the day, with a sweep of Chinese Taipei. The first match was over quickly with a 6 & 5 win, and Spain led at one point 7 UP. The second match was different. It was All Sqaure through 15 when Belen Mozo holed an eagle from the deep rough some 60 yards off the green. It proved to be all Spain would need to advance. After Japan and Korea split their matches, the Japanese were in and Korea had to wait on a possible playoff. 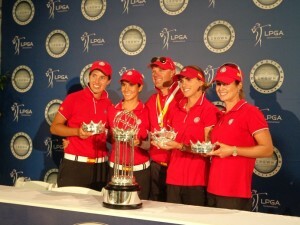 That playoff took place when Team USA could not get one point out of the Stacy Lewis and Paula Creamer match. USA a No.1 seed had to play Korea the No.2 seed to see who was going home. Sundays final day will have 10 singles matches to decide who wins the first International Crown. The point breakdown for the first three days is as follows. In Pool A Thailand 7, Spain 7, USA 6, Chinese Taipei 4. In Pool B Japan 8, Sweden 7, Korea 6 (advances as wild card) and Australia 3. Sundays singles matches will start around 1 PM EST, the Golf Channel will have full coverage of the final round action. Click here to hear Team USA’s full press conference. The Gog Blog will have a final wrap up of the International Crown here on Sunday night, stay clicked in. By: Rory Spears Lead Writer and Assistant Editor on location at the Inaugural LPGA International Crown. REPORTING FROM OWINGS MILL MD. DAY 2 of the International Crown, and because of the format and the point system to play on the final day (Sunday). Friday became a moving day for a few countries including the USA. 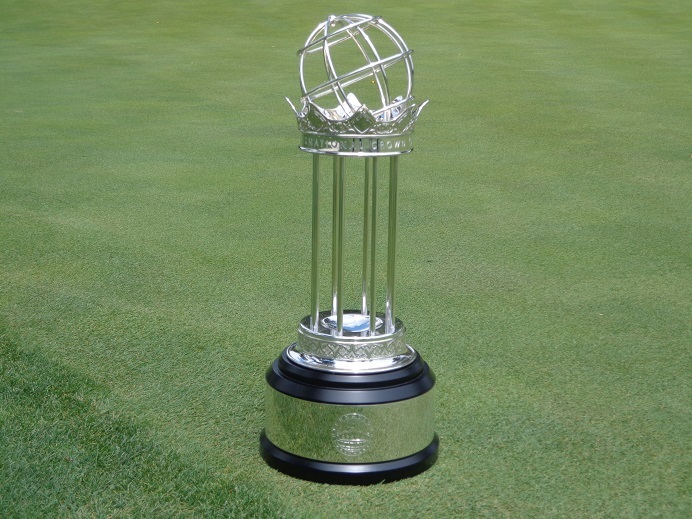 International Crown Trophy designed by Tiffany’s, on the 18th green at Caves Valley Country Club. Team USA had to make a move on day 2 of the International Crown, or the chances of them playing on Sunday were not good. So they did. Christie Kerr and Lexi Thompson set the tone by going out and winning their match by a 3 & 2 score over Spains Beatriz Recari and Belen Mozo. After a slow start Stacy Lewis and Paula Creamer took over their match with Carlota Ciganda and Azahara Munoz building a 3 up lead with holes to play. Shortly after that the match was still going on 18. But poor approach shots from the fairway after both Creamer and Lewis hit the green, left team Spain in trouble, After neither Spanish player made 3, Creamer rolled her putt up to inside of 1 foot. It was conceded for the win. The chants of USA could be heard through out the hills of Caves Valley. The gallery on 11 watches Team USA prepare to take a 3 Up lead on a birdie by Paula Creamer. The galleries were much bigger on Friday than Thursday. It’s expected they will grow even more on the weekend, especially with Team USA making a move. What turned things around for the Americans. A team bonding relaxing dinner at what Paula Creamer is calling a secret restaurant that will not be named until the tournament is over. The american team feels anyone can play with anyone, but they did switch pairings heading into day two and things did click. The matches will start on Saturday at 11:55 Am CST. The final two matches will be Team USA vs Thailand, and the Americans will keep the same pairing that worked on Friday. 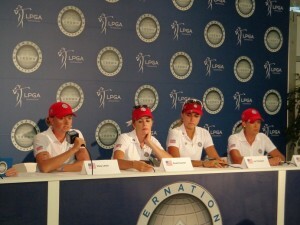 Stacy Lewis answers a question in the Team USA media session after a sweep of Spain. Saturday is cut down day as Sunday’s final round will only include five countries. The top two teams from Pool A and Pool B. One wild card team will play on Sunday as well. three countries will sit out on Sunday. None of the players want to get eliminated on Saturday and a playoff will happen on Saturday to see who gets into Sunday. Japan rallied in one match from 6 down with 7 holes to play to earn a half vs the stunned Australians. Such is the atmosphere of the International Crown. Standings headed to Saturday are Pool A Thailand 5 points, USA and Chinese Taipei 4 points, Spain with 3 points, Pool B Japan 6 points, Korea with 4 points, Sweden and Australia with 3 points. Matches on Saturday Spain vs Chinese Taipei, Sweden vs Australia, Korea vs Japan. The Golf Channel will have live coverage, a full wrap up here after play. Click below to hear Fridays Team USA Press conference. 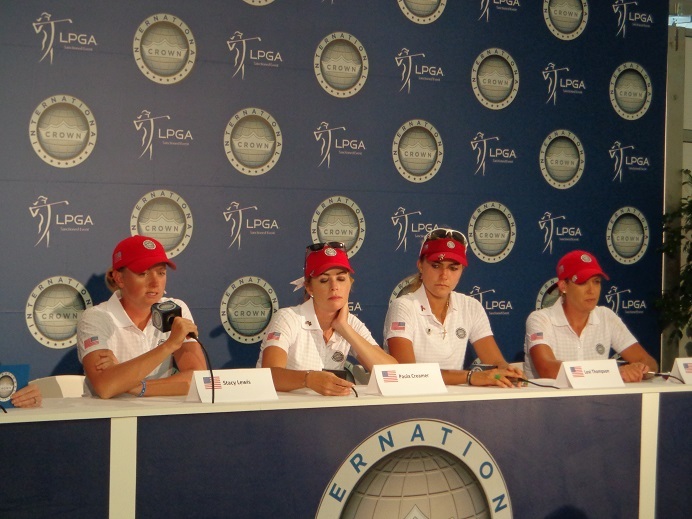 Comments from Christie Kerr, Paula Creamer, Stacy Lewis, Lexi Thompson.